57h blog article: This 14-Year-Old Girl Summited Grand Teton: If I Can Do It, So Can You! When my dad, Viktor, proposed that we go summit the Grand Teton I thought he was completely out of his mind. I didn’t know much about Grand Teton but when I heard the name, it reminded me of a monstrous mountain waiting for its next victim. Out of my whole family, I’m the least athletic. I’ve always been strong as a kid and have muscles to master anything. However, when it comes to stamina, it’s a whole different story. I was strong enough, but will I be able to last three days at such a high altitude? You see now why I was so conflicted about making this summit. My dad assured me that I’ll be more than fine, so my 14 year-old self said yes. We were halfway through our once-in-a-lifetime road trip through the west U.S. It was middle of August and we had been hiking, climbing, and camping for about 2 weeks. Our next destination was Grand Teton National Park in Wyoming. I was sitting in the car contemplating my life. What if I start going up and I realize that I can’t make it? Did I get enough sleep last night? Maybe I should go to the bathroom one last time. The shiny screen in front of the car said “in 500 feet turn right”. We are here. Immediately, my stomach knotted and my heart dropped. The big monster in front of us seemed to be reaching into space. We drove around for a little while before finding a space to park and then started our preparation. Backpack. Check. Hat. Check. Sleeping bag. Check. Food. Check. Clothing layers. Check. “Just remember the mountain looks steeper from down here than it actually is”, my dad said with a smile on his face. I knew he was right but that didn’t make the twisted feeling in my stomach go away. After a few more minutes the sound of a beep beep came from our car assuring us that it is locked. There I was, in my purple hiking pants and a grey shirt staring up at the 13,776 feet of elevation that lay before me. “300 feet”, my dad said looking at his watch that was tracking our every step. We are moving so slowly. This dragged on for hours; us on the trail, talking, asking questions, stopping for water breaks, adjusting the bulky backpacks we were carrying. We reached a part where the dirt trail stopped and a rock path continued. Actually, I wouldn’t call it a path. More like a field of enormous boulders with marked path. “Where do we go?”, I asked, reaching up to adjust my hat and wipe the sweat off my head. “Up”, my dad said simply, and continued walking up the rocks. Whooshh. I heard the roar of water nearby. Looking to my right, I saw clear mountain water running down the rocks, glimmering in the scorching sun. I slowly bent over, my yellow backpack weighing me down, and splashed some cool water on my face. Taking a moment to enjoy the beautiful stream, and re-hydrate. “Let’s eat lunch here and then we will continue,” my mom said, pulling out cold cuts we needed to make some sandwiches. I was so full on Stinger Energy Chews that I had to force myself to eat the bland sandwich. It’s always just a little longer before you reach any summit. In this case, the path was so steep and rocky that it seemed it would take a lifetime. The sun began to set and it was getting darker by the minute. That was when tears started flowing down my face, like the water running down the rocks. I was beyond exhausted, and loathed everything in that moment. At one point we came across some hikers in their colorful tents. “Do you know where the Lower Saddle is?”, we asked politely, desperate for some direction. “You see that big steep rock over there? Just go up the rope. Best of luck.” They pointed to a big cliff with a rope hanging from it. After an hour of climbing up the rope – not too difficult but a high chance for error due to fatigue – we made it to the Lower Saddle. The sight of tents made the tears leave my eyes and cleared up my blurry vision. We put on our jackets, started setting up our green, 15-year-old tent, and made our dinner. The sight of tents on the Lower Saddle meant rest, which I needed badly. “Hey this pole is about to break”, I said as I held a fragile part of the tent in my hand. “The tent is old. Go find a piece of wood that we can tape to the pole to make it sturdier” my dad said, trying to light up the stove. “Where is the poop bag?”, Jakov asked. I handed him the bag that we were given when we got our permit. We were only allowed to go number two inside of the bag, the rangers made this very clear in the beginning. The tent was set up, our bellies were filled, and the tea was brewing. We all sat on a rock looking over the horizon at the sunset. “I’ve never felt closer to all of you”, I said, admiring how we were all positioned close together in the tent like sardines in a can. I started closing my heavy eyelids and listened to the wind move our tent. I got this. We woke up right as the sun was about to peek out from behind the mountain. All of the other groups led by tour guides left before us. Their head start assured we wouldn’t be stuck waiting behind them. I gulped down some oatmeal and freshly brewed tea. Here we go to the summit. With our helmets and harnesses we made out way up the path. Well, path is being generous. It was just a steep mountain incline with rocks that tumble down if you step on them the wrong way. Everywhere you looked was exactly the same: big rock to the left, big rock to the right. Once we reached the Upper Saddle I saw that we were close to the top, but there were many more surprises to come. My dad took out his crisp new Grand Teton tour guide book and looked at where the path goes. I saw my breath in front of me, and started rubbing my hands together to keep warm. “I wanna go back”, Jakov said shivering. For a moment we all considered mom and Jakov going back, while my dad and I continue. “Jakov you came this far up. If you give up now it will all be for nothing”, I said to encourage him. We stared at the summit and agreed we’d all start the climb up. Let me make it clear: we were no longer walking, we were climbing straight up. We climbed in sections, my dad went first, I followed, then Jakov, and my mom trailed behind all of us. The cold wind whipped into my face. I stopped caring if I get a bruise or if I scratch myself, the only thing I was trying to do is get myself up the mountain. I made it, I actually managed to climb the Grand Teton. I sat down on a rock and looked over the marvelous Teton Range, Jackson Hole and Teton Valley. When I saw the view I knew it was all worth it. The real thing was so much better than everything I have seen in the pictures. I don’t want to go back down. But I had to. I got up, my tired legs trembling and the bitter wind whipping my face once again. There was a big group ahead of us, and we needed them to clear out before we could set up our anchor for the rappel. My brother and I huddled into a ball behind a rock, like two children hiding from their friends during a game of hide and seek. The only thing that I was thinking about was dinner waiting for me at the bottom. “Nika, come on it’s your turn to go down”, my dad said, handing me the rope to clip myself into. I was hanging in the middle of the air, looking up at the top where I was just seconds ago. Then, I looked down at my mom, who kept telling me to keep my legs out so that I don’t swing into the rocks. Once everyone made it down, we started walking down the rubble of rocks. Part of the reason why it took us so long to make it down was because we had no idea where we were going, everything looked the same, and we had to guess our way down. As scary as it might seem, I felt like I was a brave explorer. Mama crawling through the Eye of the Needle. I squeezed my body through the Eye of the Needle. It felt like I was going through a secret entrance to a new world. I saw the Lower Saddle where our small wrecked tent was. I’m going to roll down this mountain. A two day journey quickly turned into three day journey. We reached the tent close to sundown, and decided to spend the night. Due to our exhaustion from the summit, it would take at least eight hours back to the car. I enjoyed this extra rest. Canned food never tasted better – actually, it tasted amazing. Our injured tent would become a sardine can one last time. I was happy to be so close to my family after what we achieved together. The hard part is over, now you just have to make it back to the parking lot. I opened my eyes and peeked my head through the tent to see my dad already making breakfast. There was no rush, so we took our time packing up our supplies and enjoying a family meal. We headed down the familiar path we’d conquered just a day before. One foot in front of the other, in a few hours I saw the white car shining in the hot August sun. The best part of conquering the mountain was enjoying the hike on the way down. I took off my hiking shoes and looked down at my feet. I had covered my blisters in duct tape to keep them from getting worse. There was a clear line where my sock was. Everything above the sock was covered in dirt and everything below it was clean as a whistle. I could really use a good steak right now. As we drove off to the Teton Mountain Lodge, I looked back on the mountain one last time. This monstrous mountain that seemed impossible was now an accomplishment. The memories I made with my family on the mountain would never be replaced. Sure, we ran into some chilly weather and some training a few months before would have been nice, but all we needed was willpower. All in all, if I was able to make my way to the top I know that you will be able to as well. Just take the risk and enjoy every moment, good or bad. “Are you ready to summit the Grand Teton in a day?” my dad said jokingly. But I know deep down that he is not joking. My family is always ready for another insane adventure. For more adventure stories from the 57hours crew, including their adventurous kids, subscribe to the newsletter below! There's not much that Nika hasn't accomplished. 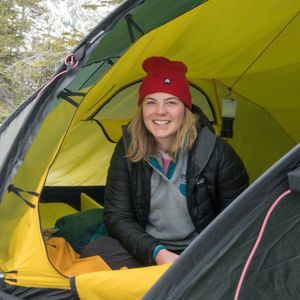 She's climbed Grand Teton and skied on several continents! She's always looking for her next adventure and can't wait to get outdoors.